For me, the words “holidays” and “traditions” go hand in hand. 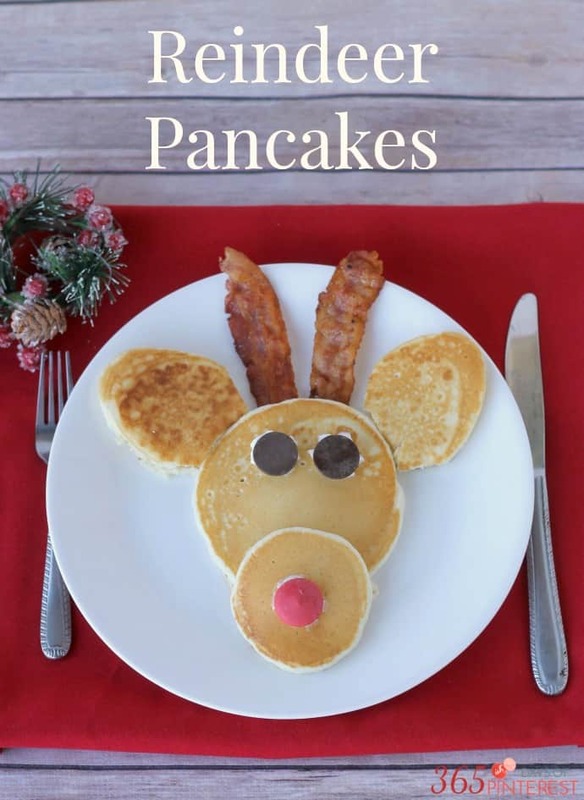 What makes the holiday season special is tradition. Those things that you do with your family every year grow to become favorite memories. 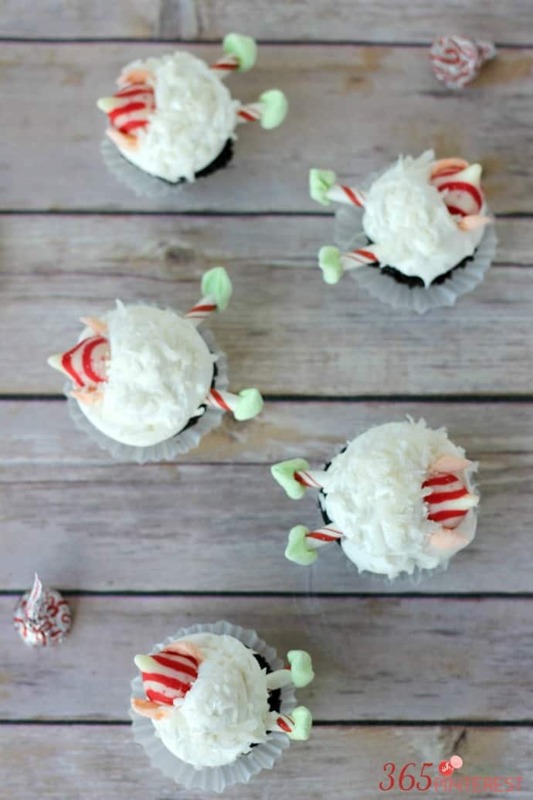 We have things we do to count down to Christmas, certain places we visit to go see the lights and decorations, and special treats like these Snowball Elf Cupcakes to eat every year. On Christmas Eve, the whole family gets together at one of the “kids” houses. We open one gift (recently the kids have all been receiving new pajamas) and then stuff ourselves silly with snacks and sweet treats. I like to try something new every year-usually a dessert, because, well-dessert’s my favorite. 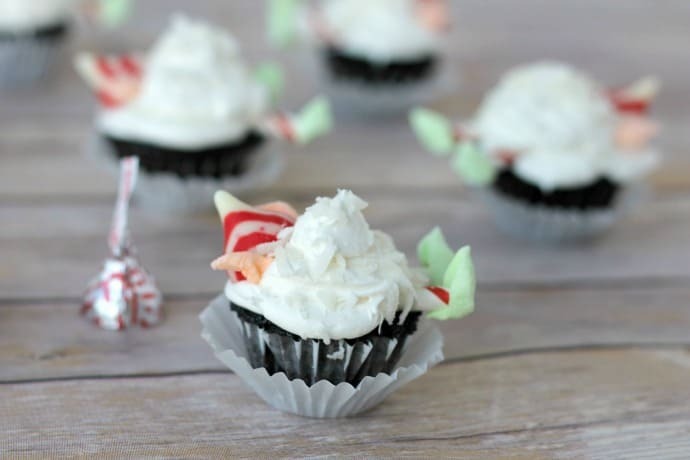 This year I’m going to bring these Elf Cupcakes. I started with a delicious dark chocolate cupcake recipe for the base. Just look how dark that is! It’s almost black and it’s oh-so-good! 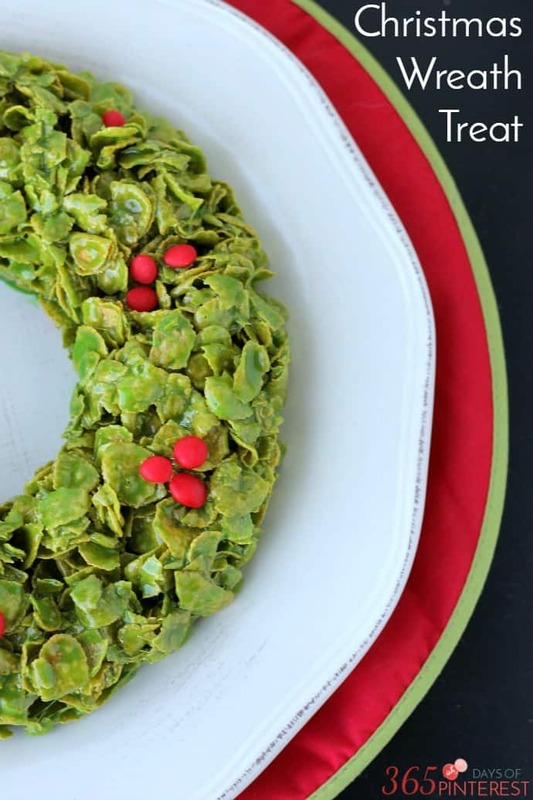 Hershey’s products make it easy to create a memorable and delicious holiday treat! Add eggs, milk, oil and vanilla; beat on medium for 2 minutes. Stir in boiling water and pour into the cups. The batter will be very thin. Bake 12-15 minutes, test with a toothpick. 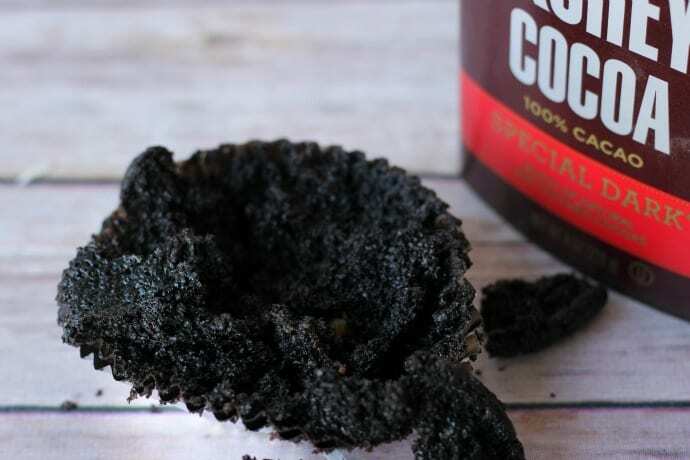 If you prefer a lighter cake, you can always use regular Hershey’s cocoa powder. And if you really have a sweet tooth, there are plenty of things to add into the batter, like Hershey’s special dark chocolate chips or Reese’s peanut butter chips. But be careful, because the batter is thin. If you stir them into the batter they will sink right to the bottom, so wait until the last few minutes of baking to add them. Start with piping a nice pile of white frosting on top of the cupcake. I used the widest tip I have for mine. This recipe is perfect for these because the cakes don’t rise and “dome” very much, making it easy to add toppings. 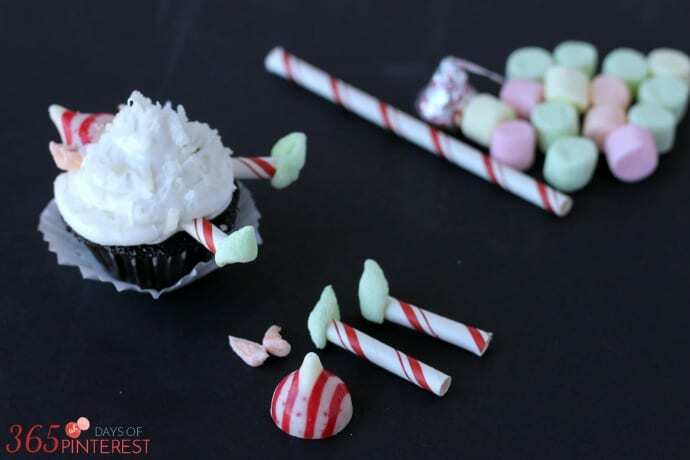 Next, you need to create shoes and elf ears from the marshmallows. The ears are made from 1/4 of a mini marshmallow. Simply cut across one on the diagonal and then cut that half in half again. 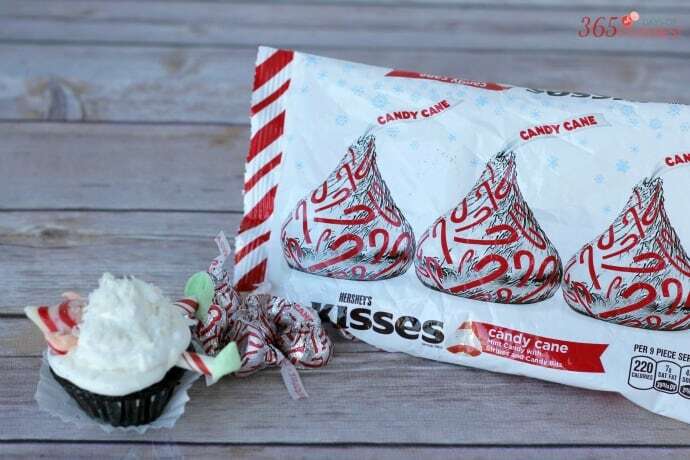 This leaves two exposed sticky sides to press onto the sides of the Candy Cane Kisses. For the shoes, do the same thing with a green marshmallow, but only cut it once. 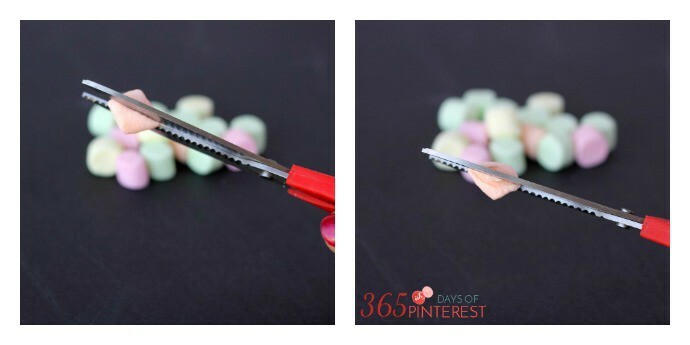 Press each half onto the end of a paper straw or peppermint stick and curl up the ends a little to make elf shoes. After you’ve made the hats and legs, simple press them into the frosting to create your snow-buried elf. You may need to pipe a little more frosting over the legs to smooth it out. Then sprinkle with coconut flakes to add to the snowy effect! If that was a little confusing, you may need to watch the quick video I made to demonstrate how to put the elf cupcakes together. I can’t wait to add these Christmas cupcakes to our Christmas Eve dessert table! They taste great and look ADORABLE. The kids love to help put on the hats and legs, so grab some Hershey’s chocolates, get the little ones in the kitchen with you and start making holiday memories! 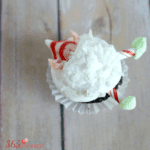 If you love these Snowball Elf Cupcakes as much as I do, I think you’ll like these other Christmas recipes!